In my last post, Camping in Peter Lougheed Provincial Park I wrote about our adventures trying to find a campsite last weekend in this crazy-popular area of Kananaskis. I'm pretty sure we all would have been in tears had we been forced to drive back to the city without finding a campsite. We'd always avoided camping in Peter Lougheed Provincial Park (PLPP) before in the middle of summer because of its popularity but I was on a mission to find out why the park was so popular with families and why it was so hard to get a reservation in the park. I wanted to know why people would have their calendars circled in red way back in April - Book Boulton Creek Campground TODAY! And it goes beyond just having to count ahead 90 days to your planned camping date; you also have to call first thing in the morning when the park office opens. Waiting a couple of hours could cost you the reservation - and no, not kidding. Craziness! We didn't have a reservation but we did manage to grab the last spot in the park I'm sure when we pulled in at 2pm Friday afternoon to the Lower Lake Campground. From our beautiful campground right on the Lower Kananskis Lake, we were able to explore the park in its glory from bike trails to hiking trails and I definitely understand more clearly now just why the park is such a popular weekend destination for families. We'd already hiked most of the popular trails in PLPP but the short family trails were all new to us so we tried to cover as many of them last weekend as we could. Each one was less than 5km in total distance so we found it easy to do at least one or two per day. We started Friday with the Rockwall Trail outside the Visitor Centre. (this is where those without kids say, "there's a hiking trail beside the visitor centre?") It's a 0.5km loop, paved, very flat, easy, and actually - not all that scenic. However, the view from the Visitor Centre below is stunning so at least stop there and enjoy the view from the balcony to the meadow out back. We didn't see any bears but apparently they like this spot so if you're lucky you might see one. Otherwise, just hang out in the Lower Lake Campground where apparently a curious grizzly bear was making the rounds on Saturday. We missed the action but our friends saw park staff chasing the bear around the campground with bear bangers, flares, and guns loaded with rubber bullets. On Saturday we headed off for a half day of adventuring on our bicycles, pulling our son in his Chariot behind us. If you visit PLPP in winter, you'd never know it but 12km of the ski trails are actually paved for summer biking. You can bike all the way from the Mount Sarrail Walk-In Campground at the South tip of the Lower Lake all the way to the Visitor Centre passing the Lower Lake, Boulton Creek, and Elkwood Campgrounds en route. The trails are quite hilly so young children (or novice cyclists like myself) will struggle at times but I found it to be relatively easy riding on the Wheeler Trail which passes through the heart of the park, connecting the two most popular campgrounds - Boulton Creek and Elkwood. We rode our bikes down to the William Watson Lodge, an incredible facility for those with disabilities. This is a great place to access the Lower Lake beach and the 3.5km Lower Lake Hiking Trail. We had great intentions of doing this hike until we saw how cool the beach was and ended up playing there for an hour instead. The photos say it best. Does hiking get any better than this? We got back on our bikes after throwing countless numbers of rocks in the lake and rode back to the Elkwood Campground to hike the Marl Lake Interpretive Trail. I have to confess that I love interpretive trails and it's not for the scenery but for those simple little numbered signs that you can use as motivation. "Ok, you found number one, let's run and find number two now." It's a great way to encourage tired feet on further. As an added bonus, the Marl Lake trail was really pretty. I was pleasantly surprised. I wasn't really expecting much but I'm glad we did it and we'll do it again for sure. It's a 1.5km loop and fully Chariot friendly should you have small children. We headed back to our campground for a brief rest before heading out on our final adventure of the day - The Boulton Creek Interpretive Trail. We could have ridden our bikes to the Boulton Bridge Day Use Area but we were tired and drove. Conflicting information says this trail is either a 3km or 4.9km loop. 2km is a big difference when you have a preschooler in your hiking party so we brought the child carrier along and our son willingly accepted the free ride. In the end, it's 3km at most and he totally could have done it on his own. Would I do it again? As a Chariot hike - yes! It would be an awesome Chariot hiking trail. It isn't paved, has some steep hills, and is more rugged than the other hikes but it's wide and smooth enough for a Chariot. If I were camping at Boulton Creek and wanted to stretch my legs I guess I'd do it again as well. Otherwise, it wasn't too exciting so we'd likely give it a miss in the future. Have I exhausted you yet with how much ground we covered in a day? We still managed to make it out for a short canoe ride in the evening on the Lower Lake, hit the camp playground (most of the campgrounds here have great playgrounds), and explore the campground's paved roads with my son on his balance bike. 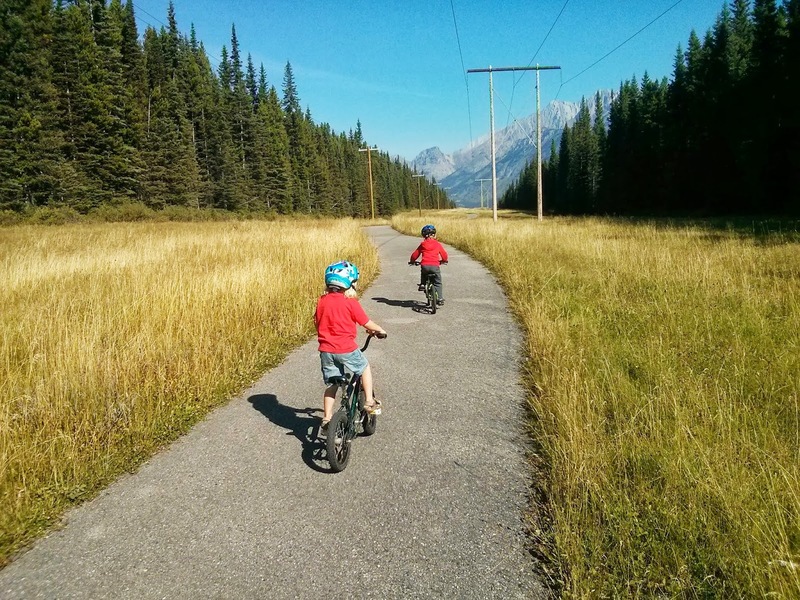 Paved roads in a campground are a huge bonus for young children learning to ride bikes and I really appreciate that about Peter Lougheed's Campgrounds. We were also able to take my son out for a short ride on the paved Lakeside Trail on Sunday which ran right through our campground. Any campground that allows for family bike riding is going to be popular - guaranteed! We didn't quite find time to visit the amphitheaters but the park boasts fabulous shows nightly at 8pm that give entertaining performances about the park's wildlife, flowers, and habitat. I've heard that the evening shows in PLPP are some of the best in Kananaskis. Personally, I think we missed the best show on Saturday when we were out hiking and missed the game of bear tag through our campground. Next time. There are two more hikes worth mentioning in the park for families. Rawson Lake is accessed from Upper Kananaskis Lake and though we've done it in the past, we felt that a 8km return hike would be too much for our son at this time. It's a great hike though if you have school-aged kids or are still a baby-wearing/carrying family. The other hike which we did venture out on is Ptarmigan Cirque at Highwood Pass. This is a MUST DO hike if you are in the area. Again, I'll put some photos below because I think they speak volumes for how beautiful this area is. I actually think Ptarmigan Cirque is the most beautiful family hike in Kananaskis. It's a 4.5km loop and though steep at first with 210m of height gain, there's no easier way of accessing the alpine with so little effort. Note, that the trail is often closed to allow the local grizzlies to forage in peace. It had just been opened that morning so we got lucky. Even luckier - we saw a grizzly high up on a scree slope sleeping. We gave him very wide birth and he never stirred. If you manage to find the trail open, be bear-aware, hike in a group, and look for signs of bear activity. This kid climbs better than me already. Have you camped in Peter Lougheed Provincial Park before? What are your favourite things to do there? We did ptarmigan cirque on July 2nd and most of the way was covered in snow, knee high and higher. Most of the people were turning back but we dicided to go on and found it very tiring (especially me as I am very heavy) and kids got exhausted so we anded up carrying them all the way down... Did you have any snow? Just check out my page on the best summer hikes with small kids for more info. They're all listed there. It's a tab at the top of the website.